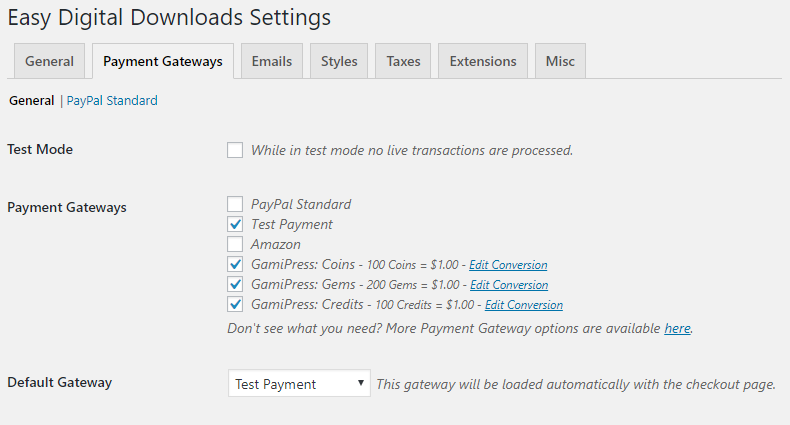 You will find the Points Gateways settings on your WordPress admin area navigating to the Downloads menu -> Settings -> Payment Gateways tab. All points types will be listed here as available gateways to be used in your Easy Digital Downloads store. From this box you can configure the conversion rate between this points type and your available currency. The value of conversion rate will define the value in points of a money of your currency (for example $1) and this amount will be applied on checkout when user choose this gateway as a payment method. Setting a conversion rate of 100 points to $1, will set a conversion rate of 1:100 which means an user can complete a purchase of $10 by expending 1000 points of this type.